Marius Beets is not only a gifted bass player he also has other talents. He is a composer, band leader, arranger and a record engineer. As a bass player he is to be heard on many productions and well known, but few people know that he is also a gifted composer and arranger. He say his arrangements are inspired by composers as Gil Evans, the man who gave big band music a new dimension in the late 1950s. Marius arranged for Trijntje Oosterhuis and the New Cool Collective Big Band. 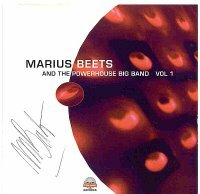 The first CD that gives Marius Beets full play is his Maxander Records production Marius Beets And The Powerhouse Big Band Vol 1. ( CD MAX 75232 ). He told me it gave him the opportunity to express his talents and to compile his own big band. The Powerhouse Big Band is not an existing group - it is a studio orchestra that contains Dutch musicians backed up with his own rhythm sextion ( Peter Beets on the piano, Martijn van Iterson at the guitar, Martijn Vink on drums and of course Marius on bass. The CDs is a surprise, as the arrangements are well done and make the band swing like hell. More then half of the tunes are compositions by the hard bop generatrion, like Lee Morgan, Horace Silver, Herbie Hancock and Hank Mobley. Three composition are made by Marius himself. The music sounds fresh and the recording is well done. I never had the feeling to listen to a dancing elephant or a porridge of sounds, something I dislike in many other big band recordings. The addition Volume 1 indicates that we will hear more from Marius's Powerhouse Big Band in the futur and I hope not to miss it.